The Scottish Wildcat has long been my holy grail of British mammals. More than any other species, this is the one I've always wanted to get a photo of. Over the last couple of years, I've made numerous attempts at capturing a Scottish Wildcat on camera, both in the Cairngorms and more so in western Scotland. Living roughly a 500 mile drive away from the sheer vastness that is Wildcat country, it's been a bit of a challenge. Up until now, the closest I'd got was last August, when I managed to get a brief glimpse of a good looking cat at night, but failed to get a photo. The mental image will always remain though. In September this year I returned to one of the most remote parts of western Scotland for yet another attempt. In addition to my usual camera gear, I had a night vision scope with the ability to record video and stills, and again I had an array of camera traps (many thanks to Gareth for the loan of those). After many nights spent with the night vision I'd failed to connect with a cat again. The camera traps had been out for just over a week. I left them in place as I headed to Mull for a few days, then collected them before the long drive home. By the time I had just one more camera trap to collect, after flicking through the shots of Pine marten, Red Squirrel, Red Deer, Badger, rodents and birds, I'd all but accepted that this was again going to be a trip where I'd fail to capture a Wildcat. The last camera was set to capture stills rather than video, and its IR beam wasn't as powerful as it could have been, but this is what it captured. A Wildcat appears out of the darkness, spending 58 seconds in frame before noticing the camera and quickly disappearing. 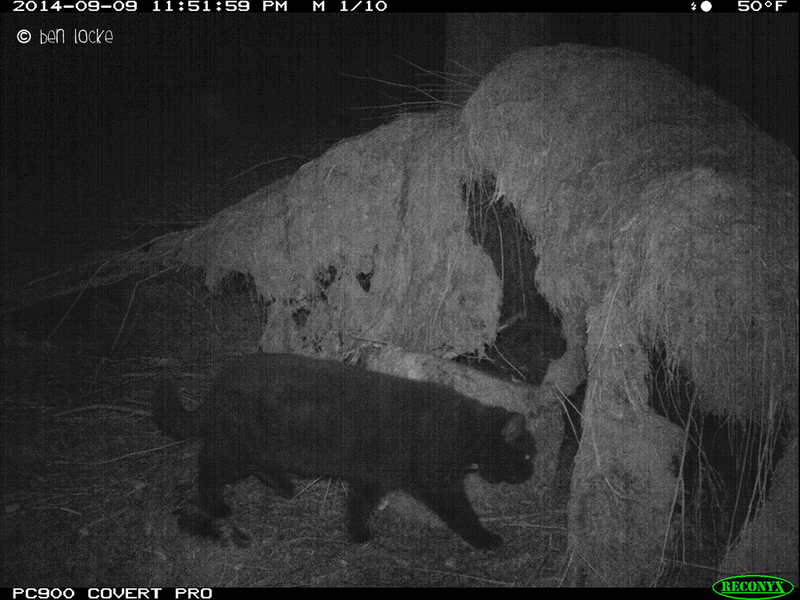 The lack of light combined with IR reflection on the fur makes it impossible to examine pelage markings, but it's clearly a large stocky cat, and it's clear from some of the stills in the sequence that this cat is wearing a radio-transmitter collar. The Scottish Wildcat is literally clinging on to existence. Current estimates suggest there are as few as 35 Scottish Wildcats left, making it quite possibly the rarest mammal on the planet. They are prone to many threats, along with many other species, such as persecution and habitat loss, but by far the biggest threat today is hybridisation. There is some very good work taking place now on the west coast of Scotland to protect the last remaining Wildcats, with minimal funding. I personally find it strange that so much money and effort is directed towards iconic foreign species (great though that is), many of which face a less uncertain future than the Scottish Wildcat, whilst at the same time our own only remaining native and endemic wild cat species is spiralling towards extinction.